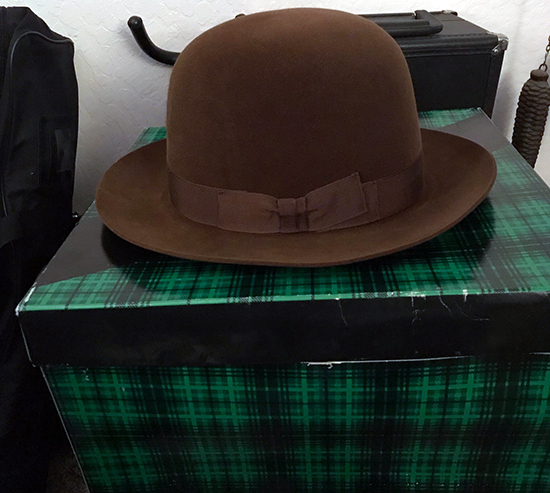 “Red’s Rare Brown Bowler Hat” was an important “prop” developed and created by Red Skelton and used by him for almost twenty years on his award-winning television shows aired on NBC and CBS during the 1950’s and 1960’s. This famous hat was specially manufactured in the United Kingdom under the auspices of Kevin McAndrew who supplied hats to famous individuals throughout the world. Mr. McAndrew’s firm operated under appointment from Her Majesty—an obvious confirmation of the importance of this bowler hat. The hat was comprised of the finest leather and felt products, and the maker registered it as number R4043 and it is further identified with the letters “XXXXX” and a width of 5 1/2. It also has a beautiful tassel which appears to be a studded rope.